World growth will be slower than expected this year and next, and will take another big hit if the U.S. fails to resolve its debt drama, the International Monetary Fund warned Tuesday. The IMF cut its 2013 global growth forecast by 0.3% to 2.9%, due entirely to a weaker-than-expected expansion in emerging markets, which had provided much of the momentum in the world economy since the financial crisis. Growth averaged just 2.5% during the first half of 2013, suggesting the world economy has seen no acceleration over the past 12 months. 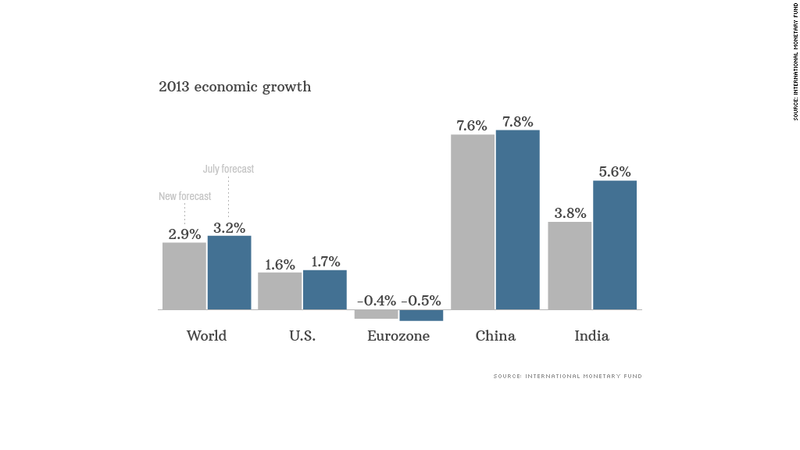 It should pick up to 3.6% in 2014, but that is still weaker than the IMF's previous forecast. "Global growth is still weak, its underlying dynamics are changing, and the risks to the forecast remain to the downside," the IMF said. The modest acceleration next year will depend on the U.S. economy picking up steam, and the eurozone returning to annual growth for the first time since 2011. At the same time, Japan will be getting less of a boost from Abenomics. Related: China and Japan to U.S.: Don't default! But all bets are off if U.S. politicians are unable to end a standoff that has already shut parts of the federal government for a week. On top of that, the country may wind up being unable to pay all its bills later this month if the U.S. government can't reach a debt deal. "A failure to promptly raise the debt ceiling, leading to a U.S. selective default, could seriously damage the global economy," the IMF said. Assuming the United States avoids shooting itself in the foot, the next big challenge will be for the Federal Reserve to start weaning the economy off cheap money without triggering the kind of financial stress that rattled some emerging markets earlier this year. The IMF has also slashed its growth forecasts for India. And with Chinese growth expected to slow to 7.3% in 2014 from 7.6% this year, some Asian economies would be even more vulnerable to an increase in financing costs. The Organization for Economic Cooperation and Development said Tuesday that growth in emerging markets in Asia will "moderate gradually" over the next five years, estimating average annual GDP growth of 6.9%.